I’ve moved your post into the specific topic for “Location Images”. Read it over and see if it helps out. If I recall correctly, the extension downloaded from the Inform website is not the latest version, which is obtained from the Public Library inside the Inform IDE. Also, the version numbers might be wrong, which may require opening your extensions folder and physically deleting it before updating from the library. Problem. I am reading the sentence ‘The room illustration is Figure of fruit’ as saying that a thing called ‘room illustration’ is a value, but this makes no sense to me - it would be like saying ‘the chair is 10’. I was able to fix the bug by replacing room illustration with room-illustration. But I’m supposed to get a window that displays the image right? That’s not happening. Do you have the image in the Figures folder which should be under the Materials folder? So there’s no issue with the image itself. Include Location Images by Emily Short. Figure of fruit is the file "fruit.png". Frosty Ground is a room. The room-illustration is Figure of fruit. Shaded Area is west of Frosty Ground. Seems to work fine here. EDIT: Does not work in any interpreter other than the Mac IDE, though. At a quick test (on MacOS), it works in Lectrote and the (unreleased) Gargoyle. Tested on Windows: works with the current Windows Inform 7 and the release Blorb works with Windows Glulxe, too. Yeah, sorry, now it works here too. No idea what I did wrong. Thanks everyone for testing. I appreciate it. Not sure what is wrong on my end. I’m using Inform 7 on Windows 10. I’ll try reinstalling. So you’re seeing an image when the file runs? Yes. The first thing I would suggest is that, after building the game, go to the Index tab, then the Contents page, then scroll down until you get to section 4 (“Figures”). That should show whether Inform found your picture in the right place. Thanks. Yes, the image is there. The room-illustration is Figure of fruit. I’ve attached a screenshot of my extensions, in the Index/Contents page. The previous poster who fixed the issue deleted all their extensions, then used the Library in the Inform7 IDE to re-download all of them. You may not need to go that far; try opening your extensions folder and remove Simple Graphical Window, close and re-open Inform to make sure it’s no longer there, then go into the Extensions>Library and tell it to download the extension. You should get the “official” updated version. It’s possible if you downloaded it from the Inform 7 website or any other location, you got a modified version possibly based on an older build of I7. If the version number you have is higher than what’s in the library, I believe Inform will resist updating it. Sometimes people will modify extensions for a specific purpose and make that available if it fills a need. INSTALLED Location Images by Emily Short (Version 1). 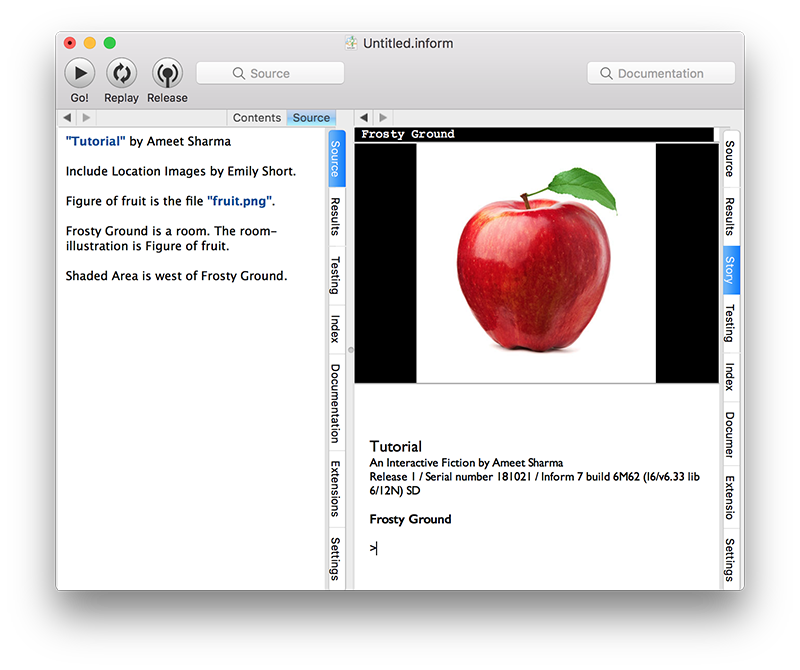 Allows the author to set per-room images and show these as the player moves from room to room. Requires Simple Graphical Window by Emily Short. 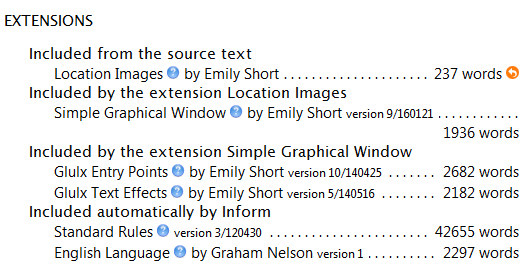 INSTALLED Simple Graphical Window by Emily Short (Version 9/160121). Provides a graphics window in the upper part of the screen, in which the author can place images; with provision for scaling, tiling, or centering images automatically, as well as setting a background color. Extension requires Glulx Entry Points Version 7. No, that looks all wrong. What I get (all extensions from the Public Library) is below. Those versions of extensions you have look to have come from the “Friends of Inform 7” GitHub page, which contains experimental and work-in-progress extensions: for example, the Public Library version of “Simple Graphical Window” does not need “Flexible Windows”. You don’t want to be using those versions without knowing exactly what you’re doing. You want to delete all the extensions you’ve installed, and then get them again from the Public Library (on the Extensions Tab). Thanks everyone. I will delete my extensions and reinstall as suggested.